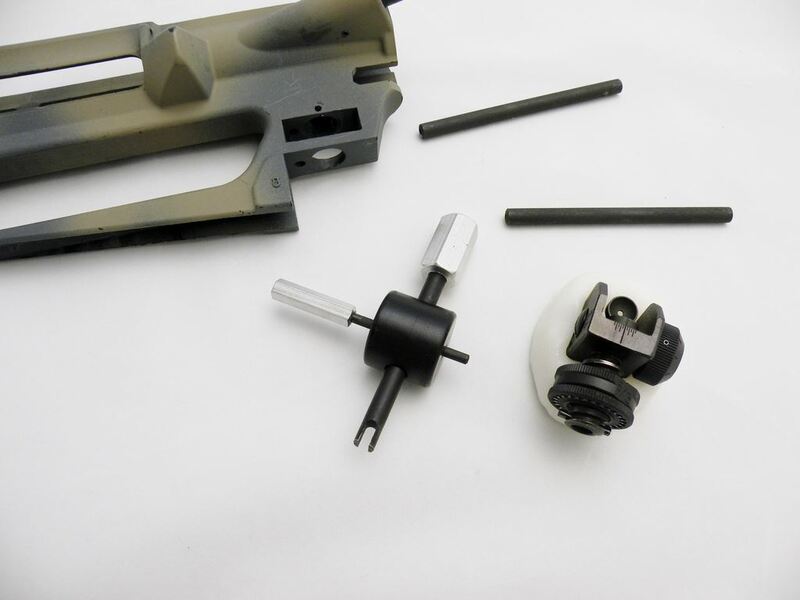 Installing the A2 sight assembly can be a thumb buster. In general, the main area of difficulty lies in compressing the spring that applies positive pressure to the sight when its elevated. For this guide, I have purchased a special tool from Schuster Manufacturing: the A2 sight installation tool. The guide below should give you a clear picture of the assembly, which overall is a simple process. I would strongly recommend buying the Schuster tool before doing this, but otherwise take your time and don’t lose those tiny ball bearings! If you want bigger pictures and text, hold down CTRL on your keyboard and scroll your mouse wheel up or down to enlarge the page or make it smaller. Step 1: Lets begin with one of the two small springs. Use a hex key to guide the small spring into the witness hole fore-ward of the large hole. The spring will drop into the bottom. The spring has slid down into the hole. The next step will be to add the ball bearing detent. Place the detent in the hole, it will sit upon the spring you just placed. The second small spring will be placed in the hole on the elevation assembly of the sight itself. The second detent sits upon the spring like so. Tip: Apply some grease on the detent to keep it from falling out of place. If the set screw is screwed into the elevation marked drum assembly, unscrew it and set it aside for now. Piece the two parts of the assembly together and push them into the pocket. Place the threaded portion of the sight assembly into the top of the receiver. Begin to turn the drum assembly: the threads will engage and the sight assembly will lower into the receiver. Done, it is bottomed out. I would suggest that the drum be up two clicks from being totally bottomed out. You probably noticed that the top and bottom portion of the drum assembly rotate independent of each other. We are going to fix that now. Rotate the 8/3 to the witness mark as pictured. Leave the bottom wheel alone. Take the set screw that you removed from your drum assembly and insert it into the witness hole on the sight assembly. The same place you put the very first spring. Screw it down with a 1/16 hex key. I use thread locker on my hex screw and I just get it snug. Too tight and the tiny hex screw can strip. Now its time for our Schuster assembly tool. Drop the large spring into the hole shown below. The spring will protrude a bit, and will need to be compressed. Insert the plastic drum into the back of the receiver and ensure the hole is centered over the spring. The large spring pusher assembly is then put in place. A view from the receiver. The tool is in place and my thumb (off camera) is pressing the spring into place. While the spring is being compressed, the final portion of the assembly is inserted into the small hole on the rear of the block. This is nothing more than a pin to trap the assembly into place so you can go hands free. Here is the assembly in place and compressing the spring for me. Take your roll pin and hammer. Here I use a Schuster roll pin holder. Much easier than using a simple punch. The roll-pin is inserted into the hole below the drum. I have driven the roll pin in until the roll pin holder bottoms out. A regular punch and hammer are used to finish the assembly. Roll pin in place. Drum Aligned. Sight is finished. The right tools are essential. I have installed a rear sight without the Shuster tool before, but I will never do that again, ever. Now I own the right tool for the job and would suggest picking one of these up before you begin your A2 assembly.